This bow is so much fun!! And it is very easy to make! The possibilities with this bow are endless! UNIT3: HOW MUCH IS IT? 3.1. Introduction. Welcome to the unit HOW MUCH IS IT? Dyslexia: Why Is This Diagnosis so Challenging? 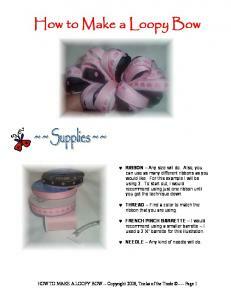 First of all, there are different ways to fold your ribbon onto the needle to achieve distinct looks. You could even mix and match within the same bow. I used dotted ribbon so that you can see the “right” and “wrong” side to the ribbon. This is the Figure 8 fold. I will be using this technique in the demonstration below. This is an Inside-Out fold. This is just a straight down fold. I’ll call this one the backwards fold – it only works with solid color ribbon – otherwise, your pattern (the dots) won’t show. 1. Once you have all your ribbon cut to size, heat-seal the ends with your preferred method. 2. Take the ribbon for LAYER 1 and place it all on top of each other. For the ribbon that only has the print on one side (the dots), you need to make sure that you place it PRINT DOWN. In this example, I placed a dotted ribbon at the bottom of the stack to illustrate how you need to fold the ribbon for Step 3. If you’re only using solid ribbon, it won’t matter how you fold it in Step 3. 3. Take one end of the “Stack” and bring it around to the other end, forming a loop. Notice how the dotted ribbon is now face-up. In fact, the two dotted ribbons will be touching each other. 4. Now you will have both ends of the ribbon stacked together. 5. At the other end you will have formed a loop. 6. Take your needle and place it into the center of the loop, stopping when the ribbon gets about half way onto the needle. Hold onto the needle with your dominant hand and let go of the ribbon. 7. Fan all the pieces of ribbon out into an even shape. You can play around with this until you get the ribbon exactly where you want it. 8. At this point I have found it VERY helpful to use a double prong alligator clip to hold the ribbon in place. Place the clip so that the needle is in between the two prongs. At any point, if the alligator clip becomes an annoyance, just remove it. 9. Take one end of the bottom piece of ribbon and fold it in your desired shape and place the end onto the needle. 10. Now take the ribbon directly next to the one you just folded and do the same thing. 11. Continue all the way around the bow. You may need to re-shape some of the loops to make sure that everything is even. 12. Now you can pull your needle all the way through until the knot stops at the back. Then take the needle and put it back through the middle of the bow – making a stitch through the center. Repeat this 4 or 5 times – or until you feel comfortable with the bow staying together. 13. If you find it difficult to get the needle through all the layers of ribbon, then use a hard surface to push the needle through, rather than using your fingers. 14. When you’re finished, this is what the bow will look like. 15. If you flip the bow over, you can see that you don’t have the ends showing. You can use either side as the “top”. 16. At this point you can also sew on a 2 ½” piece of ribbon to the side that will be the BOTTOM of the bow. This piece of ribbon will be used as another measure of keeping your bow attached to the barrette. See Step 19. NOW REPEAT STEPS 2 THROUGH 16 WITH EACH ADDITIONAL LAYER. 17. If it’s possible for you, you can sew the layers together. However, I have a very hard time doing this and so I glue each layer together. Use either Hi-Temp hot glue or E-6000, which you can find at Wal-Mart and most craft stores. 18. Here is what this bow looks like with all the layers glued together. 19. Glue your clip to the back of the bow. Use the added piece of ribbon to glue across the barrette for additional stability. Add your center embellishment for a completed hair bow. Report "This bow is so much fun!! And it is very easy to make! The possibilities with this bow are endless!"